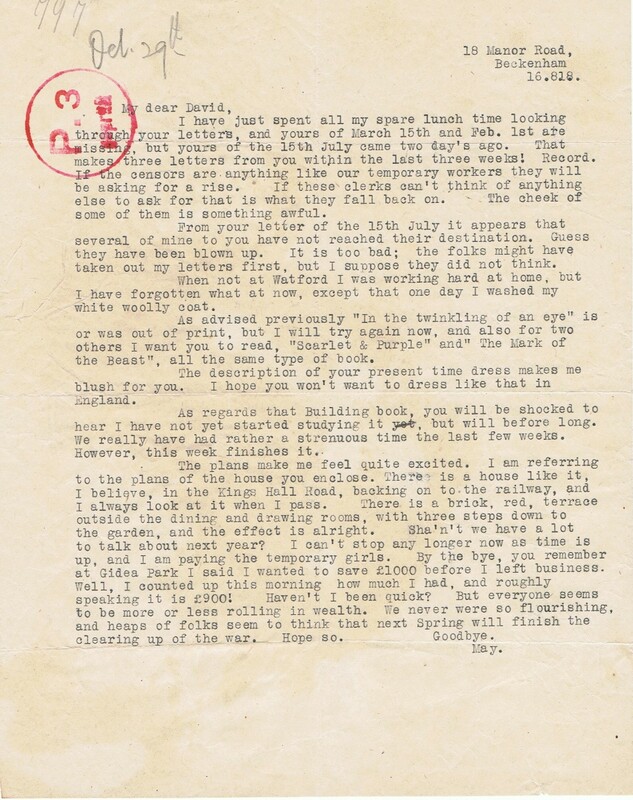 I have just spent all my spare lunch time looking through your letters, and yours of March 15th and Feb 1st are missing, but your of the 15th July came just two days ago. That makes three letters from you within the last three weeks! Record. If the censors are anything like our temporary workers they will be asking for a rise. If these clerks can’t think of anything else to ask for that is what they fall back on. The cheek of some of them is something awful. From your letter of 15th July it appears that several of mine to you have not reached their destination. Guess they have been blown up. It is too bad: the folks might have taken out my letters first, but I suppose they did not think. When not at Watford I was working hard at home, but I have forgotten what at now, except one day I washed my white woolly coat. As advised previously “In the twinkling of an eye” is or was out of print, but I will try again now, and also for two others I want you to read, “Scarlet & Purple” and “The Mark of the Beast”, all the same type of book. The description of your present time dress makes me blush for you. I hope you won’t want to dress like that in England. As regards that Building book, you will be shocked to hear I have not yet started studying it, but will before long. We really have had rather a strenuous time the last few weeks. However, this week finishes it. The plans make me feel quite excited. I am referring to the plans of the house you enclose. There is a house like it, I believe, in the Kings Hall Road, backing on to the railway, and I always look at it when I pass. There is a brick, red, terrace outside the dining and drawing rooms, with three steps down to the garden, and the effect is alright. Sha’n’t we have a lot to talk about next year? I can’t stop any longer now as time is up, and I am paying the temporary girls. By the bye, you remember at Gidea Park I said I wanted to save £1000 before I left business. Well, I counted up this morning how much I had, and roughly speaking it is £900! Haven’t I been quick? But everybody seems to be more or less rolling in wealth. We never were so flourishing, and heaps of folks seem to think that next Spring will finish the clearing up of the war. Hope so.